Welcome to The Nitty Gritty! The Nitty Gritty is a vibrant costume rental and vintage clothing store with two floors of unique vintage clothing and costume treasures for you to explore and enjoy. We are very proud and honored to have been selling vintage clothing and costuming for men and women in the lovely city of Louisville, Kentucky, since April 2000. Please come visit this eclectic destination that continues to keep Louisville Weird. Once upon a time, only a fringe element trolled thrift stores, looking for old clothes from the 1940’s and 50’s. I first became aware of it in the 1980’s, after seeing “Pretty in Pink”. I remember thinking how much I loved Molly Ringwald’s wardrobe and that of her friends (although she did a major disservice to that fabulous prom dress Annie Potts gave her). The bohemian types were the ones who were looking to the 50’s for their style back then. Over the last 15 years or so, vintage has gone more and more mainstream. Even top fashion designers look backward for inspiration. If you are new to the vintage game, there may be some things you will need to know, and will need to keep in mind. KEEP AN OPEN MIND: If you come into a vintage store with the idea “I am looking for a red 1950’s cocktail dress with a full skirt, halter style with rhinestone trim”, you are NOT going to find it. Come in with no preconceived expectations, and you’ll do fine. If you saw something in an old movie that you must find, you won’t. Think of movies today - do we actually dress like that? It’s the same for the past. The best thing in that case is to learn how to sew and make it yourself. Vintage sewing patterns are very easy to find and are not (usually) expensive. PEOPLE WERE ALL AROUND SMALLER: The average height of a woman in the Victorian era was 4’9”. Now an average woman is 5’4”. Not only have we gotten taller as humans, we have gotten wider. That is not to say that we are ALL overweight. Yes there is an obesity problem in the U.S., but even people who are slim, might have a larger skeleton than that of their grandmother. Yes, there are some very teensy people still around, but they are not the norm. We see 12 year old girls in the store who are already wearing size 12 shoes. Hormones in our food, our diets, medical care we receive all contribute to humans evolving into larger creatures. Women in the 1950’s smoked, hardly ate, and wore girdles. Most vintage clothing is going to trend towards the smaller side. It’s not impossible to find larger sizes, but small is more common. BELL BOTTOMS ARE NOT PLENTIFUL: Not just bell bottoms, but anything from the 1940’s and earlier can be rare. It wasn’t until the 1950’s that the mass-consumerism that we know today began. Up until then, people didn’t have 4 closets full of clothes. Most women in the early part of the 20th century probably had one church dress and maybe only a handful of other garments to wear the rest of the time. When we are talking about WWII, clothing was rationed; you could only get one pair of shoes per year (I would DIE!!) Stinky hippies of the late 1960’s generally wore their clothes out, so you really don’t see that many pairs of bellbottoms around. And when you do, they are teeny tiny in the waist. All of that being said don’t give up!! If you love vintage, you can make it work. I am hardly a small woman, but I have TONS of vintage clothing that I have accumulated over the years. You can’t just run out and create an entire new wardrobe of clothing from the 1940’s in one afternoon. It takes time, and more importantly PATIENCE. It has taken me years to build up the collection I have, and I am still working on it. Vintage Styles That NEED to Come Back! 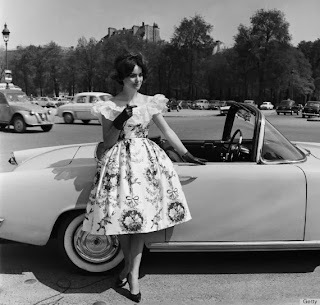 Excellent article entitled "10 Vintage Styles That Need To Come Back" from Huffington Post, via Vintage Life Magazine...TRUTH!! Positive News on Barret Avenue! After being in the business of selling Vintage Clothing on Barret Avenue for 15 years, The Nitty Gritty is expanding its business plan to include Costume Rentals. Let’s face it, people just like to play dress up. Owner, Terri Burt, has purchased a large selection of Costumes from "A Costumiery", a New Albany, IN based costume store that closed its doors last year after 26 years of providing costume rentals for the region. The Nitty Gritty has already been renting vintage costumes for Decade-Themed parties and events (1920's through the 1980's) for several years, so branching out a little further into the Costume Business seemed like a natural step. In fact, many of these “new” costumes are in their own way “vintage”, which makes them exceptional and unique. This Expanded Inventory more than doubles their offerings to include period costumes (Renaissance, Colonial Era, Victorian, and more), as well as Holiday Outfits (the Easter Bunny, Santa and Mrs. Claus, to name a few). Derby is the perfect time to consider stepping outside the comfort zone and dressing to the nines. Come to The Nitty Gritty and Rent that fabulous, show stopping outfit. They will be talking about you for months, years, perhaps. The Nitty Gritty continues to be the region's best destination and resource for quality vintage clothing and accessories for Women. They also have the area’s largest selection for Men, including affordable, new and vintage Men’s Hats. With all the recent news of doom and gloom on Barret Avenue, we would like to celebrate this Positive New Energy in the area with Hound Dog Press, who recently moved into the neighborhood, as well as with the new owners of Speier/Goomby Hardware. For more info, contact Terri Burt, 502-583-3377. Also, please check out their new web site, nittygrittyvintage.com to view some of the latest fun. You can also follow them on Facebook @ The Nitty Gritty. Did we mention UGLY CHRISTMAS SWEATERS?